You are here: Home / Sluiters / Alice / BOO! That means it’s National Blog Post Month (you know, for those of us who don’t have the stones to do National Novel Writing Month). This is where I attempt to post every single day in November. What could go wrong with that plan, right? I mean, this week is only the end of the first marking period at school. Next week is only parent/teacher conferences for both my school AND Eddie’s. We only have Thanksgiving coming up plus my starting a new marking period with my students. We only have three birthday parties and two babies due in November in our family. NO BIG DEAL. It’s the PERFECT time to try to write something post-able every. single. day. Anyway, this first post is an easy one. It’s about last night. Halloween. I sort of hate Halloween. It stresses me out and makes me cranky. I know, I know…I’m such a scrooge. Such a Debbie Downer. That doesn’t mean we don’t do the Halloween “stuff”. Everyone was in a costume (everyone = all three kids) and we had pumpkins that we actually carved. 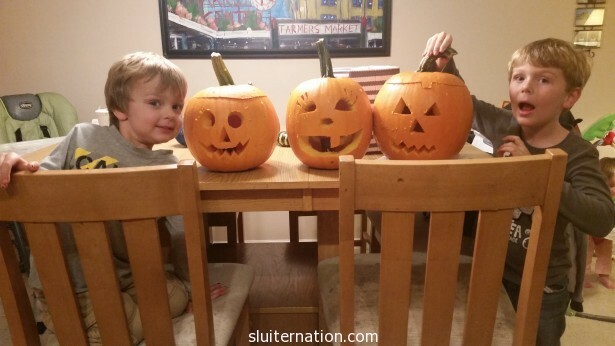 We didn’t do the pumpkin patch because it was on the list of things ain’t nobody got time for, but Cortney grabbed three great ones on his lunch break Thursday, and we carved them up Friday night. Saturday the kids dressed up in the costumes. Alice was not all that excited to have whiskers drawn on, but she got over it. Charlie was almost too excited to have a mustache drawn on. We went to first to Cortney’s mom and step-dad’s house. That is always fun because Granny knows how to rock Halloween. Not only does she have goodie bags for the kids, she also always has cookies and other snacks out…as well as a beer/wine for the parents. Plus the cousins are there too, so cute goes into overload. I know. Alice appears to be questioning all her life choices up to this point. She was so unsure of all that was going on. 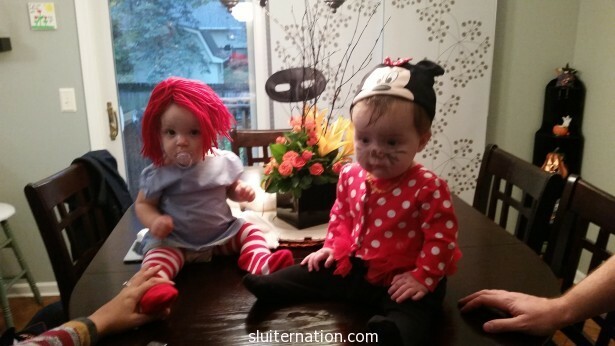 But she and her cousin, Alia, were adorable as Raggedy Ann and Minnie Mouse. If we could have just stopped here, I would have been totally cool with Halloween. 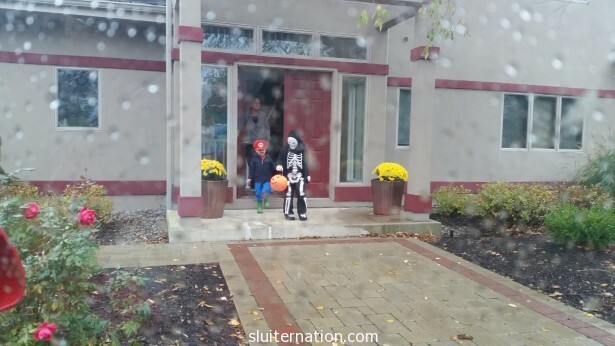 Seriously.. Maybe next year we should just go here and have the kids trick or treat their neighborhood because there were snacks and wine for adults. 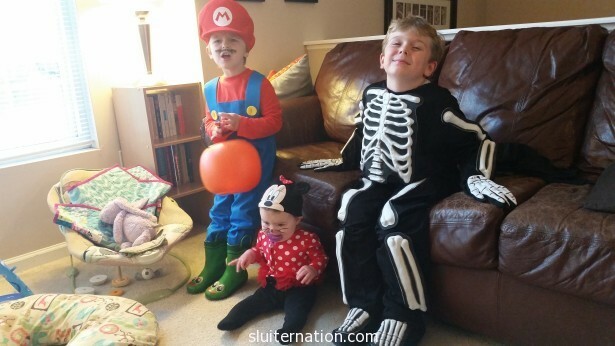 But we went over to my parents house next because Halloween is totally a grandparents dream…seeing their cutie grandkids in costume, spoiling them rotten with too much candy, and then sending them on their way. By the time we got home, it was rainy and wet and way past dinner time. But the boys wanted to go door-to-door. So Cortney took Alice in to feed her and get our dinner ready, and I took the boys to a few houses. Since it was raining and I was cranky, I dropped the boys at the first house, rolled the windows down in my car, and yelled “run to the next house!” while I slowly drove along. We did this for about 8 houses. Then I pulled their damp little bodies into the car, drove around the block to our street, and dropped them to go to the house next door to us. Then they sprinted home to ring our doorbell. As much as I was over it, I couldn’t help smile at the fact that Charlie looked just like Mario running and jumping through yards. Until we got home and I pulled shoes off and found dog poop on Eddie’s skeleton foot. Ew. But then we ate chili and cinnamon rolls and hot chocolate and all went to bed. Oh, and rolled the clocks back. That was good times too. Happy November. Happy NaBloPoMo. Let’s see if I can keep up. What a bummer that it was crappy weather for your kids. 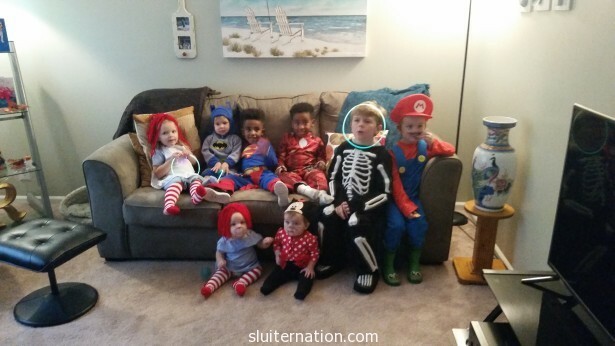 I don’t like the hype around Halloween but I do like seeing my kids excited about their costumes and seeing the neighborhood kids in their costumes. You can DO IT! Why do I like rainy photos so much, the ones where you can see droplets on a glass or through a lens? I don’t know either. Dog poop is my nemesis. I wish my nemesis was more awesomely villainous than that.